Another breakfast recipe for you today. 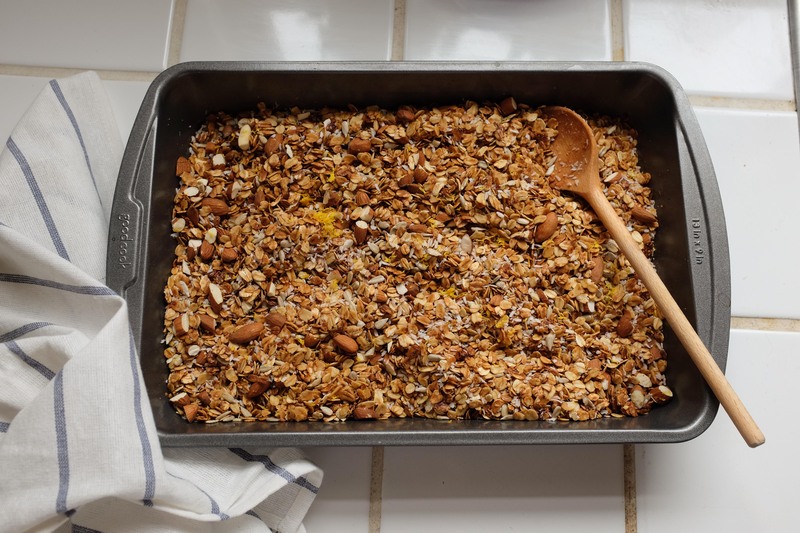 This granola is inspired by the beauty of Californian oranges, the zest adds a subtle but super tasty addition to your bowl. Melt the honey in a roasting dish in the oven as it warms up (to 180), then add the olive oil and combine. Next, stir in the oats trying to cover them evenly with the liquid. Put them in the oven for 30 minutes, or until lightly browned. Then add the almonds, seeds, orange zest, cinnamon and coconut and bake for another ten minutes. Make sure the nuts and coconut don’t burn, if they are looking a bit toasty, just take it out early. The smell of the orange, honey, coconut and almonds all toasting together is incredible. Also incredible, how cheap figs are here. Courtney M, you would be beside yourself. They top it all off so beautifully, making it a truly luxurious way to start the day.